Not one, but two 475 metre circuits under one roof. 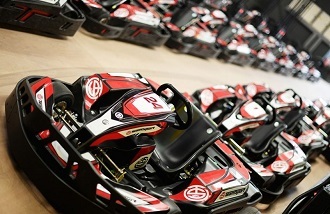 For smaller groups you'll be racing on just one of the multi-level tracks but if you're part of a corporate groups you could be clocking up lap times close to a minute as you speed around the twists and turns of this fine race track. Great facilities plus a good range of events for all sized groups. From the M1 take the A6085 exit towards A695/City Centre/Blaydon/Newburn then at the roundabout take the 2nd exit onto Scotswood Road/A189. At the next roundabout, take the 1st exit and continue onto Scotswood Road/A695. After a set of pedestrian crossing traffic lights keep in the right hand lane and at the next set of traffic lights, Volkswagen Lookers and the track will be to your right. Take a right turn here when possible and enter the car park to the right. Group Activities - Stag/Hen, Corporate Events etc. For larger corporate groups or stag/hen parties over twelve drivers there are a range of events that can be provided to suit your requirements. Just provide your preferred date and group size and we can supply full details. There is an indoor track. The venue provides cooked meals and has a bar and vending machines. There are conference facilities for 50.